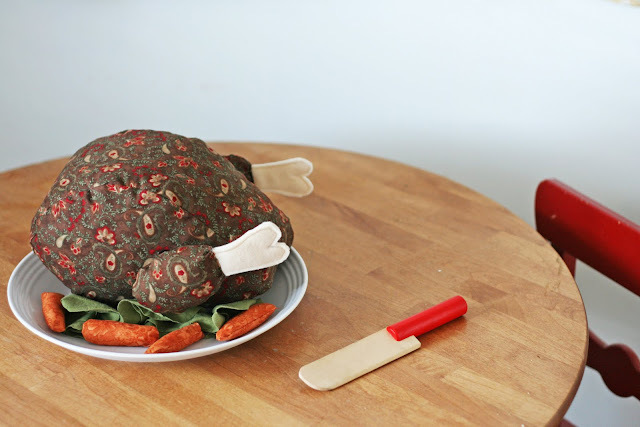 thanksgiving turkey dinner made out of fabric. turkey, garnishes, and carrots complete this super yummy feast. now all your little one needs is some guests to arrive! sure to be a crowd pleaser. for sure! i know one little girl who can't get enough of it already. i just hope my thanksgiving turkey looks as good as hers. Vanessa, that is fabulous. I can just visualise it for a little girls playhouse. That is adorable and hilarious! I don't know how you come up with this stuff! That looks so delicious! very pretty! That is too cute! I love your creativity. Your daughter will have so much fun on Thanksgiving Day cooking "her" turkey. This is hilarious! What kid wouldn't love that? Are the Turkey legs velcro-ed on? Because that would only be AWESOME! 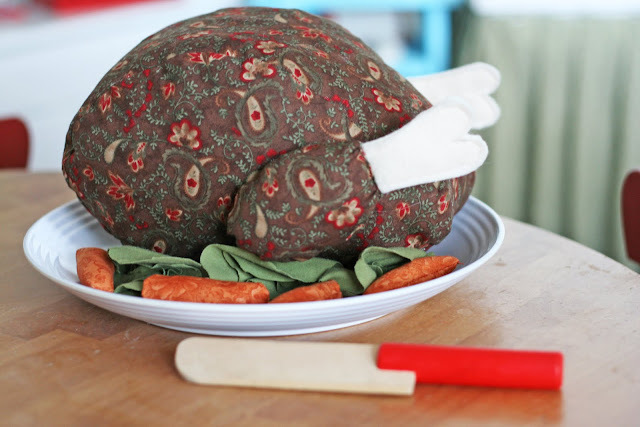 :) man...a fabric turkey...really, just too clever. Nice work! Did you include fabric tryptophan? I was curious, do you have a certain program that allows you to "write" on your photo and also for the collage at the top of your page? Love it!! Wishing my daughters were just a little younger and could appreciate it :) I'll have to put it on my "grandma list"- things that I'm planning to make for my grandchildren in 20 years or so. Does that make me crazy? Who wouldn't want to *gobble* this up?! This is adorable. Somehow you chose the perfect fabric; it looks just right. The carrots are the perfect touch!! Adorable - and it put a huge smile on my face! Fabulous! Had to have... thanks for the tutorial! I stocked up on a couple other tutorials too!Couldn't resist... LOVE your blog.. You are AH-Mazing! Hysterical!! You for sure need a mom of the year award for that one!!!! I can almost feel the excitement your daughter must have! That is sooo cute!! I think I've died and woke up in Thanksgiving Heaven!! Almost peed my pants 'cause I'm laughing so hard...this is so dang, dang, dang cute! You think of everything. I love the little carrots! I'm sure Katie is loving the whole dinner too. So cute - as usual. I love it, and it's low fat too! very cute. Do the drumsticks come off? It looks like they are attached with velcro. So clever! Vanessa...this may be the cutest thing I have ever seen. Do those fabric slices of pumpkin pie go with the turkey? Hope you do win~several of those could be yours! Cute. Fun. Funny. = YUM! LOL I actually laughed out loud! So awesome! How did you think this, it's wonderfullllll. Perfect project for those of us who'd rather sew than cook! Cute as can be! SEW cute- fun to play with and cute on display! Oh my gosh, that is just too cute! Love it!! ps: are you still going to watch "new moon", I will!!!!!! Very cool!!! Thanks for sharing. Greta idea! My grand kiddos would LOVE it. Thanks for sharing, love your blog! Way too cute! Oh my you are amazing with your creativity. I am truly impressed. Please throw more cute ideas at us!!! laughing so hard at this turkey..... He's just too cool for words... Bet my grandkids would like him in their home. 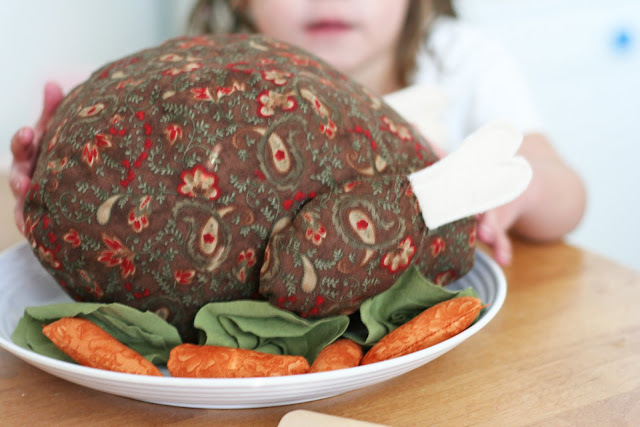 can't I just PAY you to make me one and not have to actually sew it myself...come on, how much does a turkey like that go for? I'll pay! Dying over your turkey, Vanessa. DYE. ING! Oh you're gonna get a prize all-right. ME at your front door. Be careful what you demand... you might just get it! that is my kind of cooking!! love it. that turned out so cute!